Why do some learning experiences stay burning in our brains and others fade into oblivion? 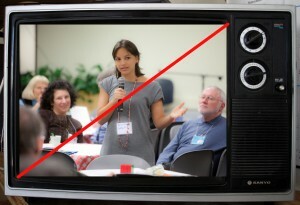 Here are the four Pecha Kucha presentations that EventCamp East Coast participants experienced on November 5, 2011. They were followed immediately by small group discussions to cement and broaden the resulting learning. Traci Browne: A journey inside the mind of a conference producer. 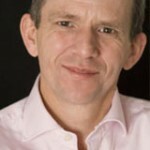 Paul Cook: Risking your hybrid event. Jenise Fryatt: Build connections, gain business and personally grow by using the EIR social media strategy. Andrea Sullivan: Designing meetings for the virtual brain. In my experience, when you get a group of professionals together and give them the opportunity to determine what they’d like to talk about, you’ll end up with enough viable topics for several days of sessions. EventCamp East Coast (EC²), held earlier this month, was no exception. 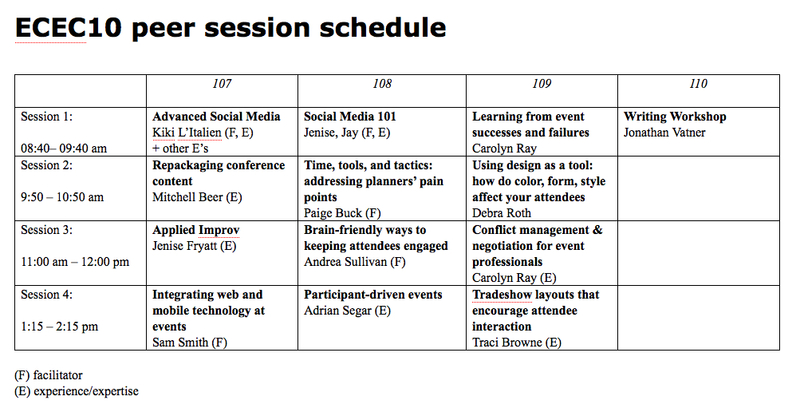 The final peer session schedule, shown above, was optimized for the single day that was available, and I was pleased to see significant attendance at every session. How do I get sponsors and fundraise for my event? Sales & marketing: How to sell yourself and/or your product. Subcontracting services for major corporate events. How to connect with event planners, speak their language, and open them up to social media/virtual events. What are the key pieces you need to start a community like #eventprofs? Sustainability issues and the future of meetings. How to get clients/partners to adhere to timelines for deliverables. Ways/incentives to get attendees to sign up for events early. It’s always interesting to compare a peer conference program’s topics with the ones that a traditional program committee would have chosen. In my experience, the best program committees predict only half the topics that attendees actually want! Do the topics requested at EC² surprise you? What proportion of them would you have predicted? Mitchell Beer & Gary Brown at EC². Photo by Karen Brown. One of the reasons I love to facilitate Conferences That Work is that I get to learn interesting things about the culture of the participants. Whoever they are—young developing leaders, childcare workers, in house and outside counsel, information technology professionals, food policy wonks—each peer group responds a little differently when given the opportunity to determine the form and content of what happens at the event. At EventCamp East Coast (EC²) I discovered, not surprisingly, that event professionals have their own set of distinguishing features. I made (at least) a couple of mistakes while facilitating EC², both related to participants’ loquaciousness. With other peer groups, during the opening roundtable ~30% of attendees don’t take the full time they’re given, typically 90-150 seconds, to answer the three questions. This did not happen at EventCamp East Coast! Just about everyone took full advantage of the 2½ minutes they were allocated. In addition, I made the big mistake of not cutting off the oh-so-charming Sam Smith when he went way over his allotted time. Naturally, some of the folks who spoke after him followed his lead, and I was too chicken to call them on it. The end result was a roundtable session that ran nearly thirty minutes late. My bad. I should add that I was impressed by how well EC² participants knew and communicated what they wanted to get out of the event. Not only do event professionals like to talk; they’re good at it! 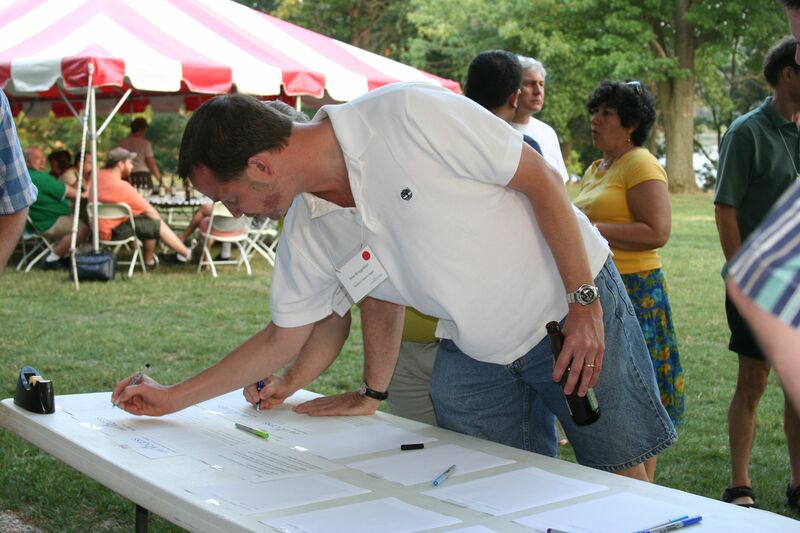 In the past, at peer session sign-up I’ve always found that some attendees ignore?/don’t hear? my repeated requests not to sign their names under topic suggestions until all the topics have been suggested. EC² #eventprofs were different! They listened to my instructions…—and followed them! EC² participants were also quick to point out that I didn’t cut people off when I should have (see above); i.e. they called me on not following my own instructions. Love you guys! A surprising finding from the interviews I conducted for my book Conferences That Work was that the median answer to the question “What is the percentage of the (traditional) conferences you’ve attended where you either left before the end (for other than practical reasons) or wished you had?” was 25 percent! At my events, I’ve found the percentage to be much lower, but some people always leave before the end for logistical reasons. At EC², I was impressed by how few participants left early, and at the level of concentration and involvement that persisted until the very end of the final group spective. This was followed by a wonderful volunteer group effort that quickly returned our LaSalle University venue to its original layout. Event professionals rock! While it’s not surprising that the level of feedback that I received at EC² about the Conferences That Work event design was far greater than at other events I’ve facilitated, I was delighted by the quality of comments and suggestions made. Usually I get one or two good ideas at an event on how to improve what I do. EC² provided a steady stream of commentary and fresh ideas, not only during the event, but also afterwards via participants’ evaluations, several fruitful phone calls with individual attendees, and finally in a long Skype conference with my wonderful co-organizers, Traci Browne and Lindsey Rosenthal. So many great proposals were made that, after I’ve tried some of them out, I’m thinking of writing an update for purchasers of my book. Despite these interesting comparisons between event professionals and other peer groups I’ve worked with, there are far more commonalities than differences in how peer groups respond to the “structured unconference” format of Conferences That Work. 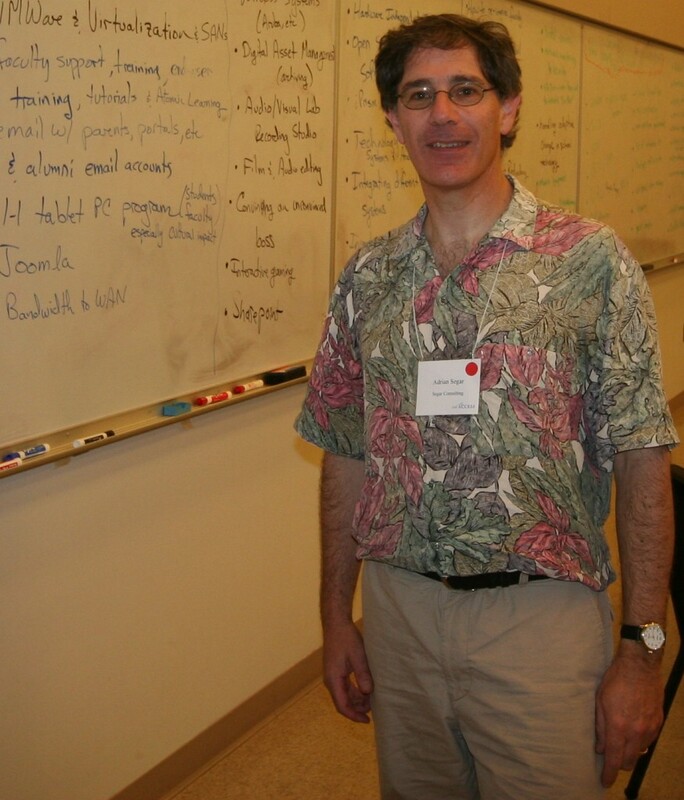 Comments like Deb Roth’s: “(the format) allowed us all to get to know each of the 40 people well, better then other conferences that I have been to with 2000 attendees“; Howard Givner’s: “It was literally impossible for anyone to fall through the cracks; everyone got immediately swept up into the flow of the event and was steadily woven into the fabric of group experience“; Sam Smith’s: “I have never been to a conference where I felt like I got to know so many new people so well“; and Eric Lukazewski’s: “…it was a spectacular thing to watch each individual “bring a brick” and marvel at the creations, knowing that WE EACH contributed to what was left standing” are responses common to every event I’ve run. When it comes down to the bottom line, people are much more similar to each other than different. Do you have other observations about characteristics of event professionals? How are we different from other peer and professional groups? 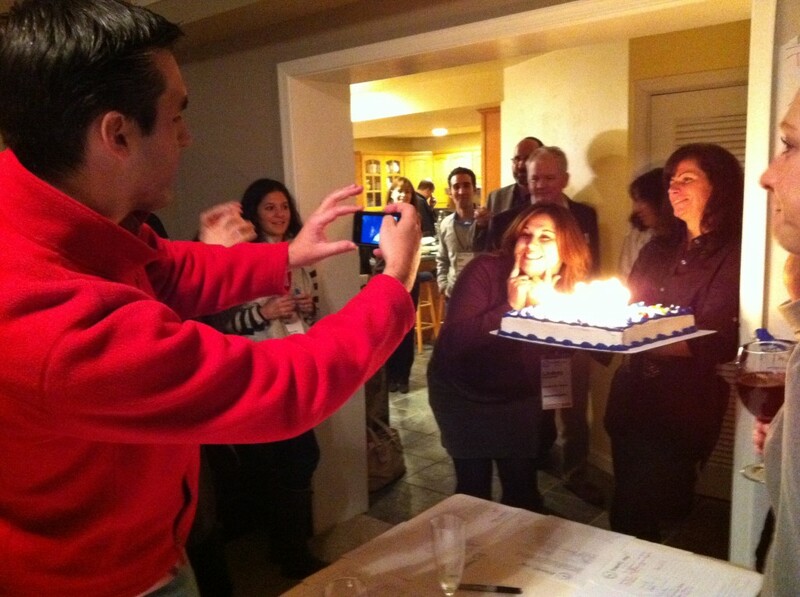 Lindsey Rosenthal posing with her birthday cake on Friday night. Photo by Karen Brown. I’m still sorting out the lessons I learned from facilitating and organizing EventCamp East Coast, and I’ll be writing about them soon. But, while the memories are still fresh, I want to offer appreciations here for the incredible contributions the organizers, volunteers, and participants made to the event. During lunch on Saturday I shared these thoughts with the participants, and now I want to share them with the online community. CAUTIONS: 1) I’m 59 and my memory is not what it was. If I’ve left people or assistance out or got details wrong, let me know and I’ll make it right. 2) This is my personal experience of EC²—I attended just three of the thirteen sessions offered, and did not manage to talk with every attendee, so please forgive me if your contributions and sterling qualities are not given the acknowledgment they deserve. Paige Buck, you came all the way from San Francisco as a Conferences That Work trainee, and threw yourself into helping in every way you could: scribing the roundtable, working effectively on the peer session determination, facilitating the session Time, tools, & tactics: addressing planners’ pain points, and assisting with every logistical need you could. I appreciate you for the skills, charm, wisdom, and humor you brought to EC², and look forward to working with you in the future. Carolyn Ray, you traveled from Montreal to volunteer at EC², and I was struck by your infectious calm & cheerful demeanor as you seemingly effortlessly dealt with a myriad of issues as they came up. Oh, and besides efficiently helping with peer session determination, you also led two sessions: Learning from event successes and failures and Conflict management & negotiation for event professionals (bet you didn’t expect that). I appreciate you for your enthusiasm, passion, warmth, and your willingness to share your surprising knowledge with others. Mitchell Beer, Andrea Sullivan, & Traci Browne – you, with Paige & Carolyn made peer session determination at EC² one of the easiest processes I’ve led recently. You worked with me late into the night while others were partying. I appreciate you for your quick thinking, expert advice on how to cluster topics, and whether to combine them, and unfailing good humor during the whole 14-step process. Paige I’ve already mentioned, but Cameron Toth, you were the scribe that gave that extra I hadn’t even thought to ask for: documenting the roundtable process and, without being asked, jumping up to fill flip chart paper with the salient points from the group spective. I appreciate you for your boundless energy, willingness to help in any way you could, and your continual flow of ideas and possibilities. Oh, let’s not forget your fashion style! 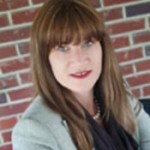 Traci Browne (Tradeshow layouts that encourage attendee interaction) – see below. 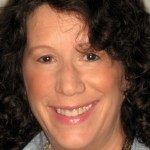 Jenise Fryatt (Social media 101 and Applied improv) – Jenise, I appreciate you for your ability to say YES when the moment comes, your thoughtfulness and accompanying clarity of expression, your kindness to all, your enthusiasm for new experiences, and your infectious cheerfulness and tact. AND… you’re a superb teacher of improv! Debra Roth (Using design as a tool: how do color, form, and style affect your attendees) Deb, it was a treat to be invited into your creative world. I appreciate you for your straightforward manner, your kindness, your calm guidance during the session, and your evocative, creative talents. Mitchell Beer (Repackaging conference content) I wish I could have attended your session, Mitchell. I appreciate you for your enthusiasm for my event design, your cheerful professional demeanor, and the blush worthy positive feedback you bestowed which means a lot to me, given your 27 years experience attending and recording conferences. Andrea Sullivan (Brain-friendly ways to keep attendees engaged) This was the session I most regret missing. I appreciate you for the experience, ideas and energy you possess, and am looking forward to talking with you further next week. Sam Smith (Integrating web and mobile technology at events) Sam, thank you so much for coming to EC², and your calm acceptance and positive response to an event design so different from what you dazzled us with at EventCamp Twin Cities. I appreciate you for your depth, your knowledge, your ability to make wise choices, your fundamental fairness, and your vocal support for this event. Jay Daughtry (Social media 101), Jonathan Vatner (Beginning writing workshop), Kiki L’Italien (Advanced social media). Jay, Jonathan, and Kiki: I don’t know you well enough to say much (though I’m skeptical about that bacon-flavored vodka, Kiki), but I appreciate the three of you for stepping up to the challenge of leading event sessions with little warning, and reappearing triumphant at their successful conclusion. Karen Brown, Eric Lukazewski, Cameron Toth, Lindsey Rosenthal, Traci Browne, Heidi Thorne, Sam Smith, Jenise Fryatt: I appreciate you all for taking the time to snap, video, upload and tweet photos and moving images of EC². Your work will help to keep memories fresh, and show some of the atmosphere and abundant interactions at EventCamp East Coast. And Andre Flewellen Photography and Ken Kauffman Photography: thank you for donating your services to further document our time together! Susan and Ernie of The Twisted Gourmet – what a feast you provided us at EC²! What more could we have asked for? Thank you! Beth Brodovsky, what a hostess you turned out to be for our Friday night party! I appreciate you for graciously offering the use of your home by fifty strangers, and for your unflappability as we moved furniture from one room to another during the party, stuck paper all over your living room walls, and prepared food in your kitchen. (And on an unrelated note, I also appreciated your incisive contributions to Deb’s design session.) We all owe you a big vote of thanks! We had ten wonderful partners at EC²: BizBash Media (represented by president Richard Aaron, and associate editor Anna Sekula), Grosh Backdrops and Drapery, Omnipress, EventMobi (represented by founder and president Bob Vaez), etouches (represented by vice president Suzanne Carawan), Echelon Design, Inc. (represented by marketing and creative director Eric Lukazewski), Promo With Purpose (represented by founder Heidi Thorne), The Conference Publishers (represented by president Mitchell Beer), CharityChoice, and Planet Planit. All of you made this event possible through your donations of services and/or financial support. As Lindsey & Traci are well aware, I am somewhat cautious and picky when it comes to working with partners for my events, but with you there was no need for caution. 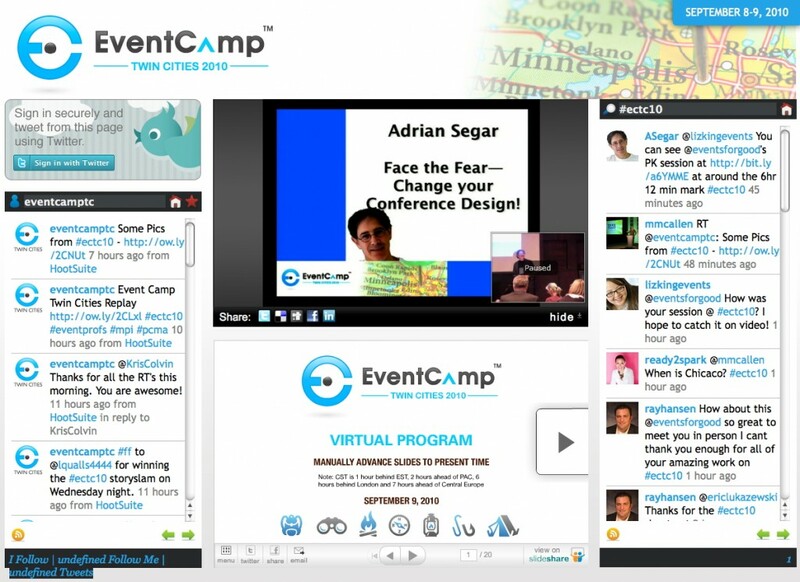 You supported EventCamp East Coast enthusiastically and we all benefited from the relationship. I thank you, as do all of us who attended. Almost last, but far from least, are my two fellow organizers, Traci Browne and Lindsey Rosenthal. EventCamp East Coast was held because Traci, whom I met at the original EventCamp in New York, bought my book, became excited about the event design and wanted to see what Conferences That Work was all about. When she asked me to help create a regional EventCamp, I accepted immediately. Without Traci’s belief in me and my work, EC² would never have been born. So Traci, I appreciate you for possessing that trust and belief. But there’s much more. I also appreciate your passion that fed us as we worked through one logistical problem after another, your forthright temperament to “tell it like it is” coupled with a surprising flexibility and tact that made you a delight to work with, your sense of humor, your integrity, and, perhaps most important, your big heart hiding under that superficially cynical exterior. I’d work with you again in a minute, and hope to do so often. Lindsey, at Saturday lunch at EventCamp East Coast I described you as “a force of nature”. (That, in case anyone is unclear, is a good thing.) Lindsey, I am so grateful you joined Traci and me and took on so many of the responsibilities of making EC² a success—we could never have done what we did without you. I appreciate you for your wonderful, unique mixture of drive (don’t step in her way, folks) and charm (Lindsey can put anyone at ease in about ten seconds), as well as your burning integrity, the passion you wear on your sleeve, your hard work ethic, and, like Traci, a big heart. Lindsey & Traci, I appreciate you so much for taking responsibility for the event logistics so I could concentrate on facilitating EventCamp East Coast. Finally, I want to acknowledge all of the attendees of EventCamp East Coast. You created this event. None of you were passive spectators. I appreciate you for actively participating, for shaping EC² into the event it became, for freely sharing your knowledge and experience for the benefit of all, and for taking risks in what you said and did while we were together. Together, we made EventCamp East Coast into something unique and wonderful. Thank you! Reading Sam Smith’s frank article about the resources and effort that went into the production of the remote component of EventCamp Twin Cities (ECTC) got me wondering. I counted ten full-time staff needed to create the remote component of this amazing event, which delivered an impressive participative and immersive remote audience experience. Most, if not all, of these people needed to be around for at least half a day before the live event. And none of them (I hope) are normally paid minimum wage. All this does not usually come for free. I’m not privy to the financial details of EventCamp Twin Cities, but I do know that much of the above was donated by the companies and personnel involved, and that this generosity is and was much appreciated by all of the local and remote attendees. These substantial sponsorships of the event made it possible to offer free remote passes to the remote audience, making it easy for 500+ people to tune in and enjoy a superb remote audience experience. What I’m wondering about is the economics of creating hybrid events when the time of donations disappears, and the fine folks at companies like Intefy, SonicFoundry, and Allied Productions & Sales, need to get paid for their time, equipment, and expertise. I’m guessing that the regular price tag for a setup like the one used at EventCamp Twin Cities might run in the region of $30,000. (Please, those of you who actually know what these costs are; stop laughing and enlighten us.) If so, that translates into a cost of around $60 per remote ECTC attendee. Perfectly justifiable if that attendee would otherwise have to pay for a plane, accommodations, travel time etc. to attend in person. Another thing to bear in mind is that the costs to provide the two-way interactivity that was a hallmark of ECTC were largely fixed; they’d be more or less the same if 100 or 1,000 people had showed up. In the former case, the cost becomes $300/attendee—an amount that might be a concern for many event planners working with small or highly specialized target audiences. I don’t see many possibilities for reducing the personnel numbers and outlay required to run a good hybrid event. I expect that equipment and bandwidth costs will decline in the future, but I’m willing to bet (and would love to be proved wrong) that the expense involved to add a remote audience with the capability for meaningful participation will remain a significant component of a hybrid event’s budget for a long time. What do you think of the hybrid economics I’ve described? 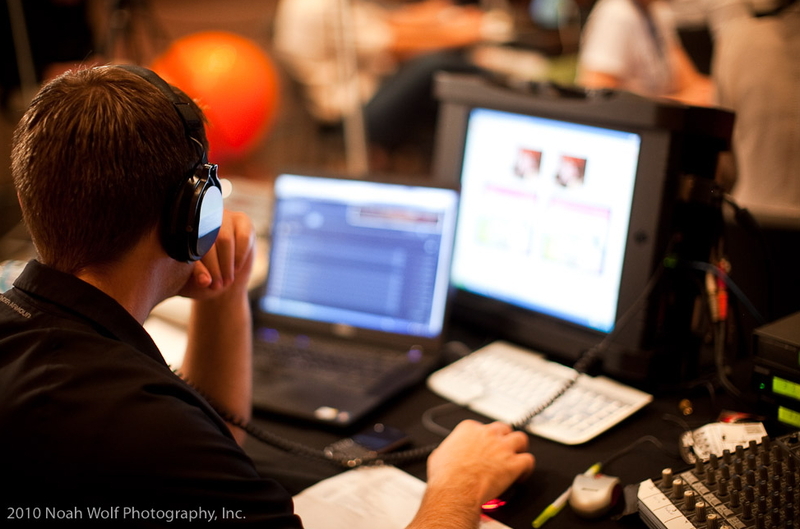 Can you provide better figures for the expense to add a remote audience to a hybrid event? Will the relative costs and rewards act as a deterrent to you to add a remote audience—or do you see them as an income producing opportunity? Face The Fear—Then Change Your Conference Design! 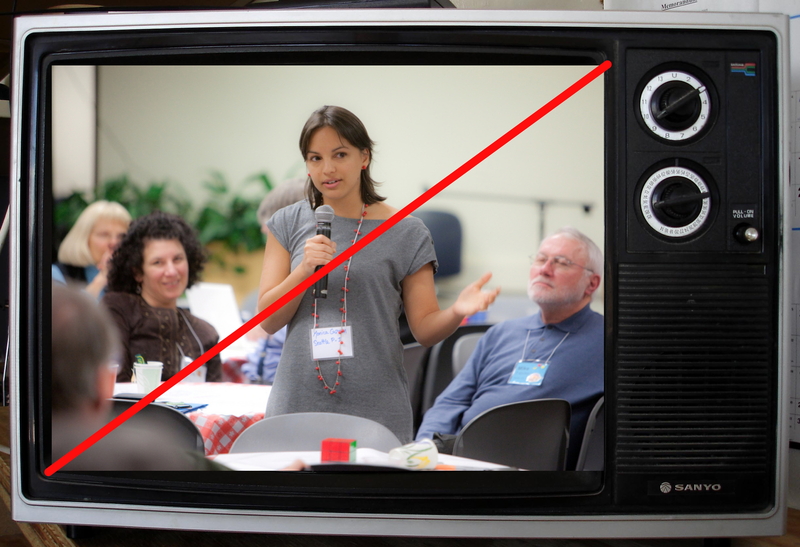 Want to see my 6 minute 40 second Pecha Kucha presentation Face The Fear—Then Change Your Conference Design! given at EventCamp Twin Cities on September 9, 2010? If so, download this PDF and then open the recorded stream (8 hours and 48 minutes!) of the entire event. Don’t worry, you don’t have to watch the whole thing! Simply move your cursor into the center pane (the one with my name and smiling face) and drag the progress bar that appears to the 6 hour and 27 minute mark. You’ll be able to watch me give the talk in the small inset window, while following along with the slides in the PDF. P.S. If you’d like to watch any or all the seven Pecha Kucha sessions, here’s a list of them, together with the haiku(!) written to introduce each presenter. Scroll the progress bar to the time indicated to watch. Knows how to coil a cable! Wife. Mom. Biz Owner. Loves sports. Love to meet you all! What do you think of the Pecha Kucha format for event sessions? Did you find the fast pace and short presentations refreshing? Should we have squeezed in some time for questions and answers? Watch a little piece of Conferences That Work streamed live! 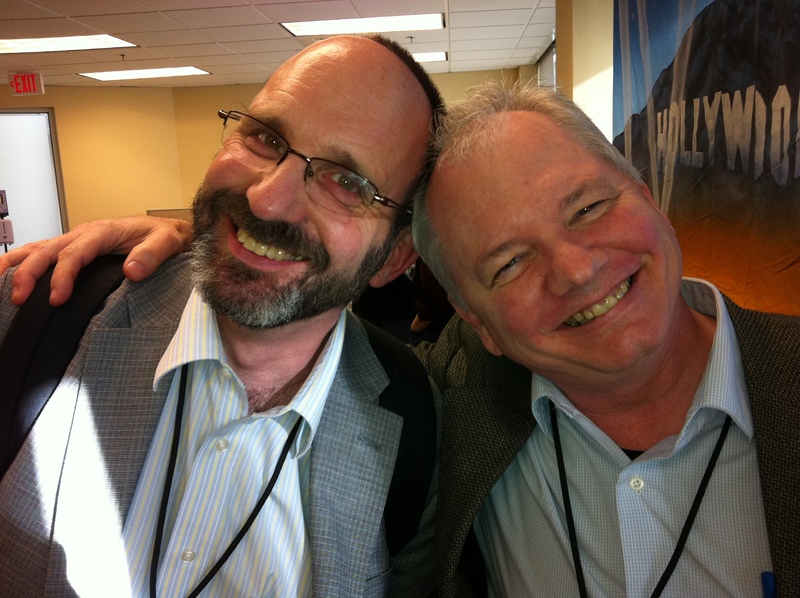 If you’ve registered for EventCamp Twin Cities as a remote attendee (it’s free!) you’ll be able to watch a live stream of me running a personal introspective from the comfort and convenience of your web browser of choice on Thursday, September 9 at 4:15 p.m. EST. This will be the first time I’ve ever facilitated a personal introspective with a remote audience, and I’ve added an experimental way for remote attendees to share the results of their introspectives online. [You’ll be able…] to view the video stream and the slides from the main sessions, [and have] the ability to participate in the backchannel with on-site attendees and other remote attendees. The official Twitter hashtag is #ectc10. Also, there will be a hybrid moderator that will capture your questions and comments to share with the greater audience. And, we will be using PollEverywhere to allow ALL attendees (face-to-face and virtual) to vote via Twitter or their mobiles when speakers are asking questions. 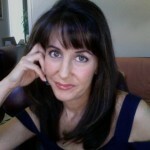 In addition, Emilie Barta, the virtual emcee will guide you through the event and make sure that you are connected to the face-to-face audience. In between sessions, she will interview speakers, sponsors and attendees to add additional context to your event experience. And it’s all free. All you have to do is register for the free Virtual Event Community Pass and fire up your browser on Thursday! I may not see you at EventCamp Twin Cities (though I’ll be scanning and responding to messages via my Twitter feed throughout the event.) But I hope you’ll drop in and see me and the other wonderful people and sessions we’ve created, and interact with us too. Don’t miss this unique opportunity! Thank you for your efforts in making our very first national lab manager meeting a huge success. The meeting far exceeded my expectations and I have been reporting the success of the event to the leadership here at HHMI.